Материалы 20 апреля 2019 г.
Седмица 6-я Великого поста (седмица ваий). Лазарева Суббота . The Gospel story of the Resurrection of Righteous Lazarus is one of the earliest depictions in Christian pictorial art. 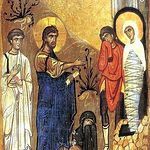 Most likely the iconographic tradition of the Resurrection of Lazarus formed earlier than the celebration of this Gospel event.